I first found out about School of Rock 3 years ago, when this started as a simple blog. The Allentown location was above Dave Phillips Music and Sound on Union Blvd. The first time I saw a performance? Fullerton Fair 2012. Not even 2 years back in the Valley, I had a lot to check out. School of Rock was definitely on the high priority list. Over the past 3 years, both locations have evolved. Including seasonal shows at Rivals Sports Bar in Easton and now, the new location! Ray was giving tours, even though my expectations were high, the new location exceeded them. 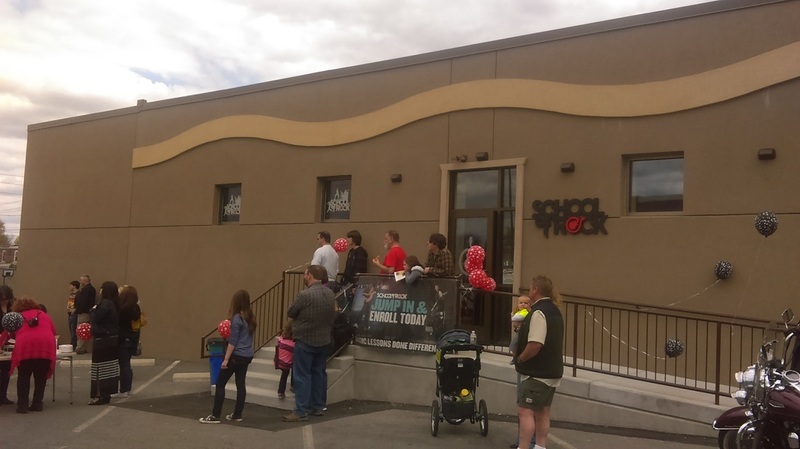 More space and rooms / a lot of time involved with overall design and layout / plus a few surprises and ideas are all a part of School of Rock Allentown and Easton. Ray and Sue, the instructors and students are very passionate about music and everything they do. School of Rock is not only for younger people. They also have classes for adults. With the new location, I am seriously looking forward to watching the evolution. Ray, Sue, and everyone involved, you pulled off a great Re-Grand Opening! Can not wait to see where things go from here.